Day 1 Entebbe: On arrival you will be transferred to your hotel. Day 2 Entebbe/Kibale National Park: Travel by road to Kibale National Park, stopping en route to visit a tea factory and Fort Portal before an afternoon arrival in Kibale. the Ruwenzori range in the north, along the shores of Lake Edward to the remote Ishasha River in the south, incorporating a wide variety of habitat. 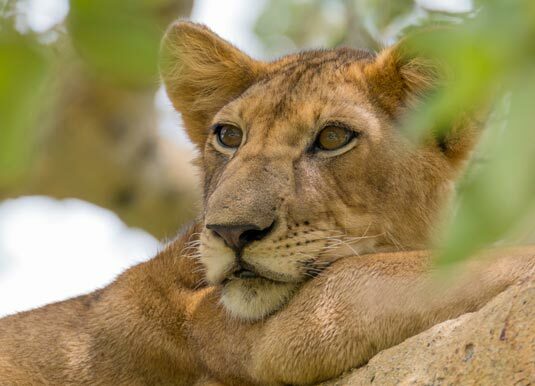 Day 4 Queen Elizabeth National Park: Early morning game drive in the park, which has over 100 mammal species including lion, hippo, buffalo, leopard, elephant and numerous primates. Return to the lodge for time to relax before an afternoon boat ride on Kazinga Channel, keeping your eyes peeled for hippo, crocodile and other wildlife. Day 5 Queen Elizabeth National Park/Bwindi: This morning's game drive is in the Ishasha sector, where tree climbing lions are found. Continue to Bwindi, the home of mountain gorillas, but also a refuge for elephants, chimps and numerous bird species. Day 6 Bwindi: Very early start as you set off on your trek in search of mountain gorillas. The trek with an experienced ranger will take between 2-6 hours, but is well worth the effort. As an alternative, there are several shorter walks that you can take, including the Mubwindi Swamp Trail (3 hours) where you may see elephants. Day 7 Bwindi/Entebbe: Drive back to Entebbe (a flight is available at a supplement) where your tour concludes with your onward journey. Accommodation: Boma Guest House, Entebbe; 4* Crater Safari Lodge, Kibale National Park; 3* Katara Lodge, Queen Elizabeth National Park; 3* Buhoma Lodge, Bwindi. Meals: Breakfast at Entebbe. Full board in all other destinations. Tour price: The price shown is based on the best value travel dates in low season and includes airport transfers, travel by 4x4 private vehicle with an English speaking guide, accommodation, game drives as outlined, chimpanzee and gorilla trekking experiences (including permit). Flights from the UK are not included.